Love food? Love art? 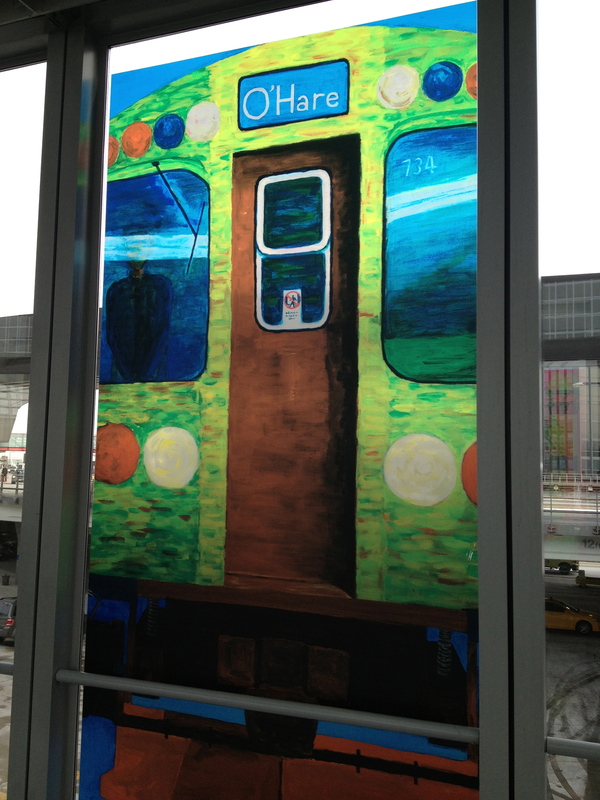 Route yourself through Chicago O’Hare! | Oh, the Places We See . . . Lately, I’ve done a lot of flying. From Knoxville to Vegas to Michigan to Maryland. A lot of flying. I may even be identifying with George Clooney’s character Ryan Bingham in the 2009 hit movie Up in the Air — almost comfy in the confines of an airport. Not only that, I really love grazing and shopping while waiting for yet another take-off. Airports today — at least the big ones — are havens for gourmet foods in take-home packages, upscale restaurants bearing the names of chefs we’ve seen on TV, and power-up centers for tech-hungry travelers. 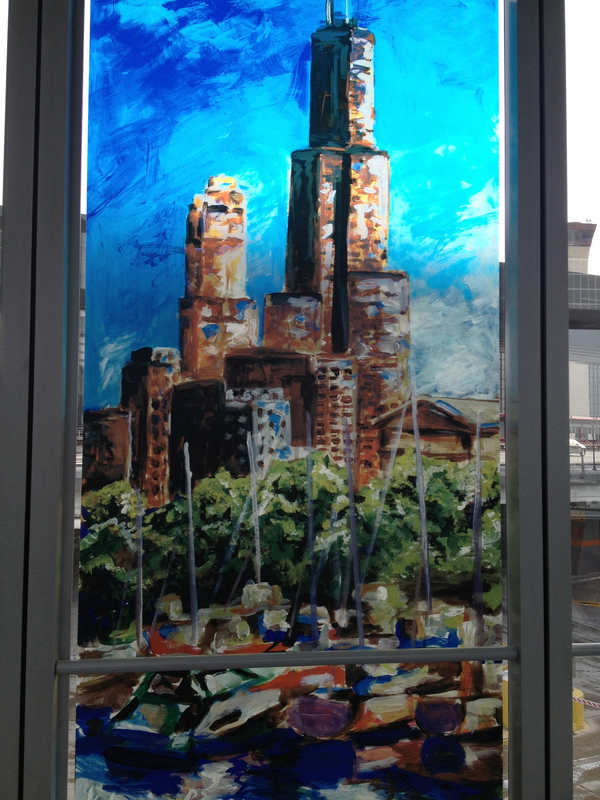 Case in point: Chicago’s O’Hare International. But long layovers mean more time to watch people sprinting (roller bags in tow) to their next departure point. And more time to admire the art. And sample the food! On display near Terminal 1. 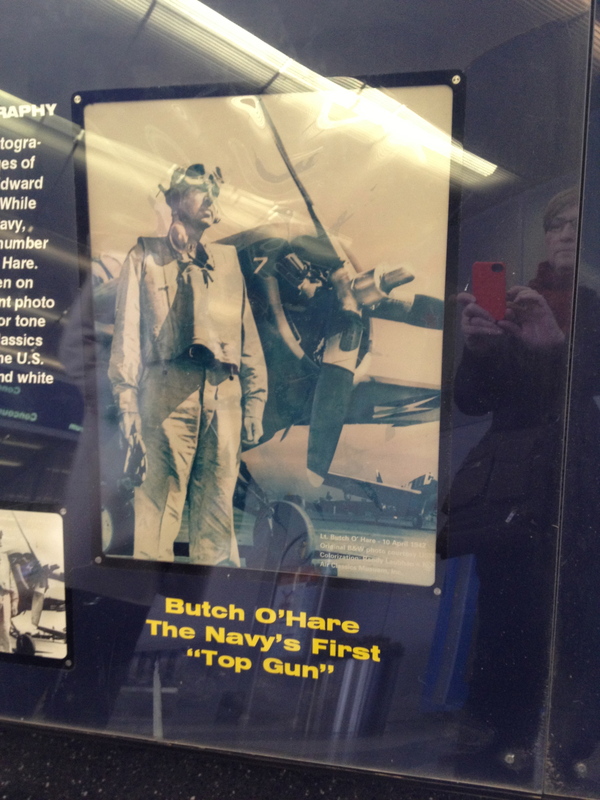 O’Hare International was named in honor of Edward Henry “Butch” O’Hare, a Medal of Honor WWII fighter pilot whose Black Panthers fearlessly stormed the skies. In 1949, the field and airport known as Orchard Depot was renamed O’Hare International Airport. But not even O’Hare could imagine what the terminals of this second busiest airport in the U. S. and the world would look like today. 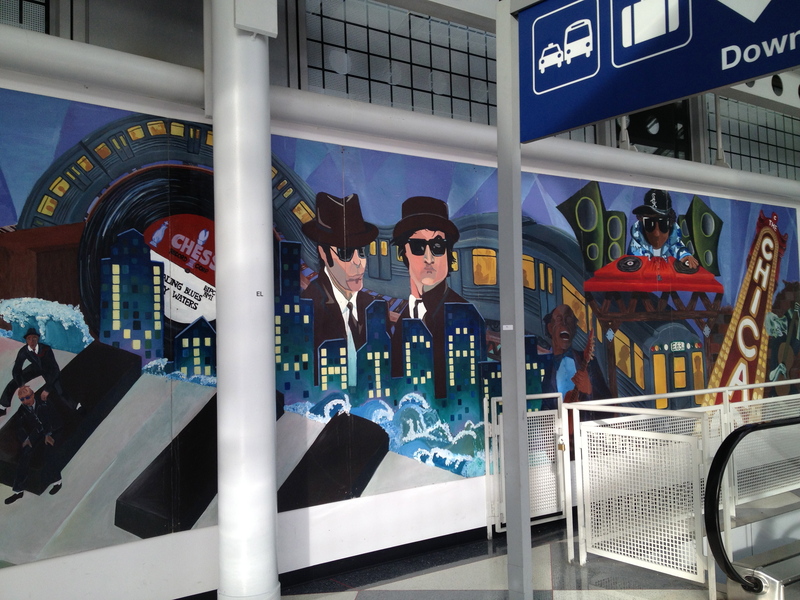 “Songs of Chicago.” Mural by teens in After School Matters. Passing through the domed glass corridor leading to Terminal 1, you can delight in the art of teens engaged in a program called After School Matters. Teens paired with professional artists have created art — benches, murals, painted windows and walls, glass sculptures, etc. — that deserves a closer look. 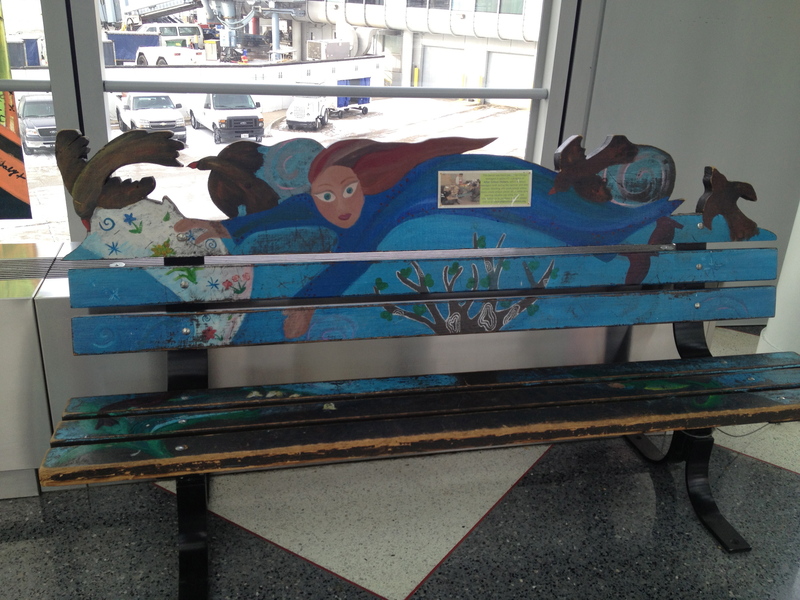 One of the creatively painted benches lining the corridor leading to Terminal 1. But from there, the shopping begins in Terminal 1. On this cold, cold Friday, lines at Starbucks meandered through the corridor. Patrons craving something hot to sip checked emails while waiting for lattes, talls, or the new Blonde Roast. 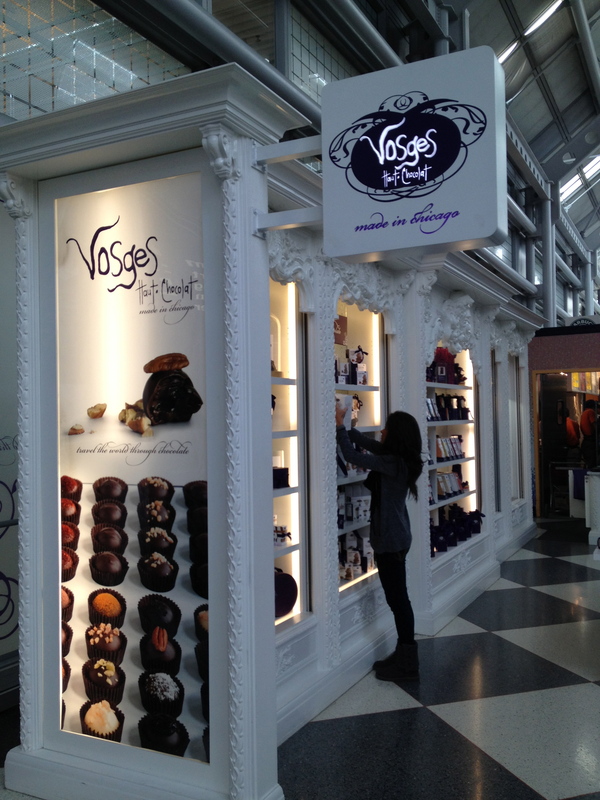 I passed by Vosges and kept my chocolate passion in check since it’s still January and you know how those resolutions are! Begun in the kitchen of her Chicago apartment, owner and chocolatier Katrina Markoff relied on her training at El Bulli restaurant and her international travels to launch a “veritable chocolate revolution,” according to the website. I can give it this: simply divine packaging and product, if you can judge just by looking! If an ordinary Montblanc writing instrument won’t satisfy your desires, check out the Writers Edition Carlo Collodi limited edition. 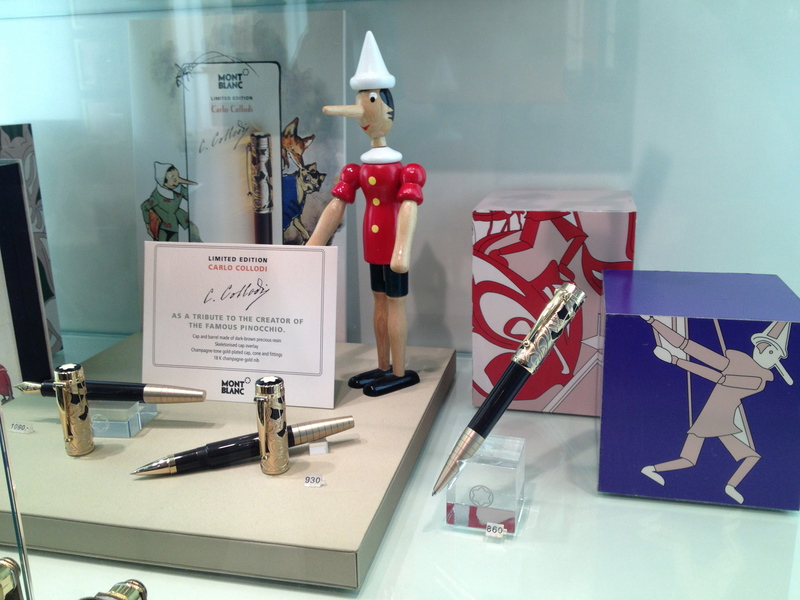 Honoring the creator of The Adventures of Pinocchio, Carlo Collodi, the pens are a tribute to the author’s creativity. A dark brown cap bears pictures of animals like the loyal cricket and the shady fox while the cone resembles Pinnochio’s legendary growing nose. It can be yours for approximately $1000.00. So? It’s a limited edition, after all. 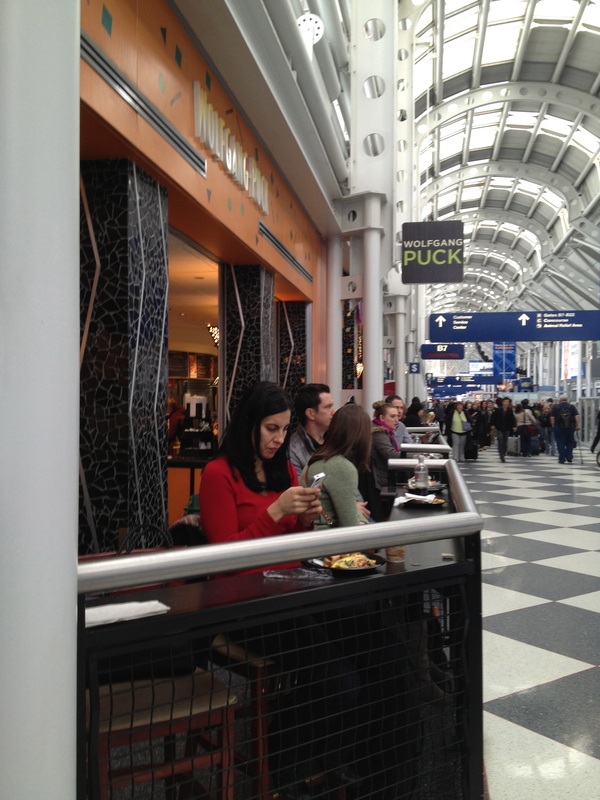 Diners at Wolfgang Puck’s restaurant have front row seats where layover travelers can watch the on-the-move travelers go by. Well, some of them watch, I guess. Mostly, though, people that day were focused on their smart phones, or that’s what it looked like to me. We’re a nation of email checkers, for sure! My picture of the Field Museum Store doesn’t do it justice. Loaded with little take-home gifts, especially for children, the store is neat and engaging, even if it is overshadowed by the ceiling-tall replica of a dinosaur skeleton. And if you weren’t traveling, you could go to the real museum to check the rest of ’em out! 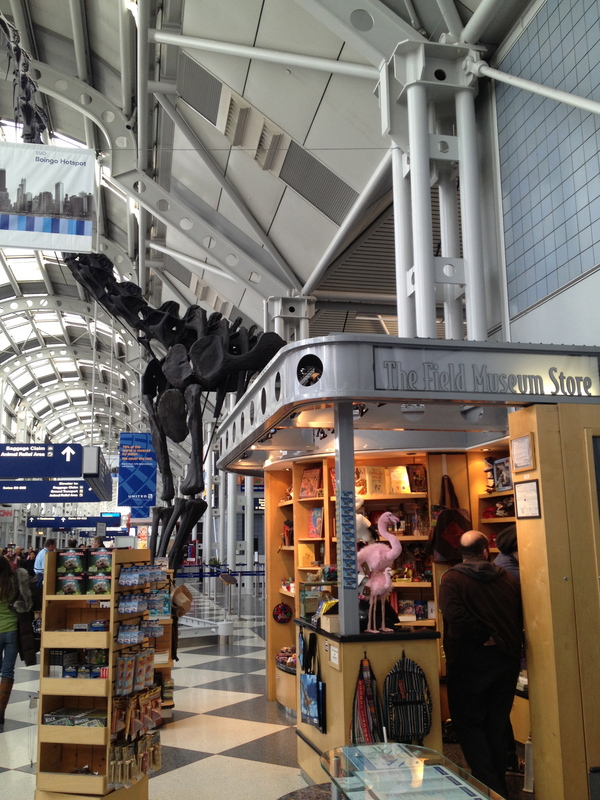 Look behind to see the towering dinosaur skeleton behind the Field Museum Store. 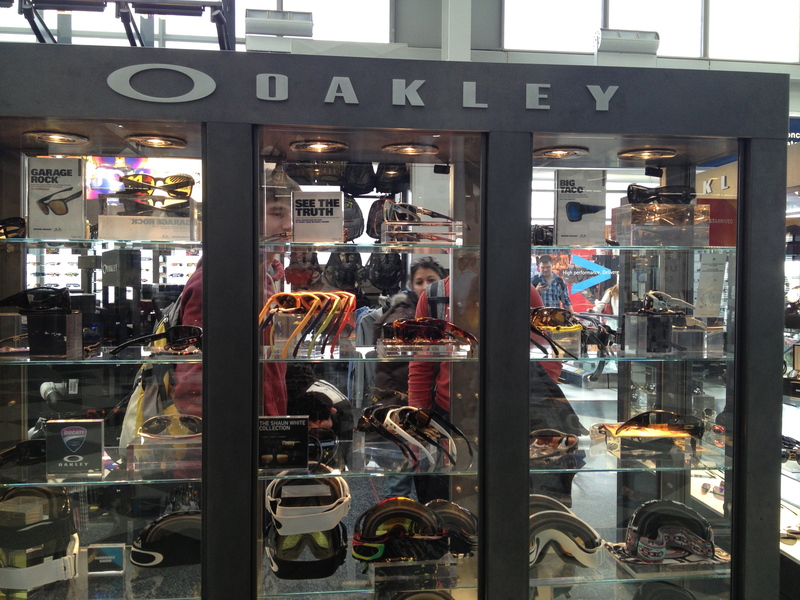 Oakley was busy selling sunglasses the morning I was there — maybe to travelers needing eye protection at the ski resorts or in the Midwest where looking at snow can make you squint, for sure! I spy someone peeping through the Oakley case! 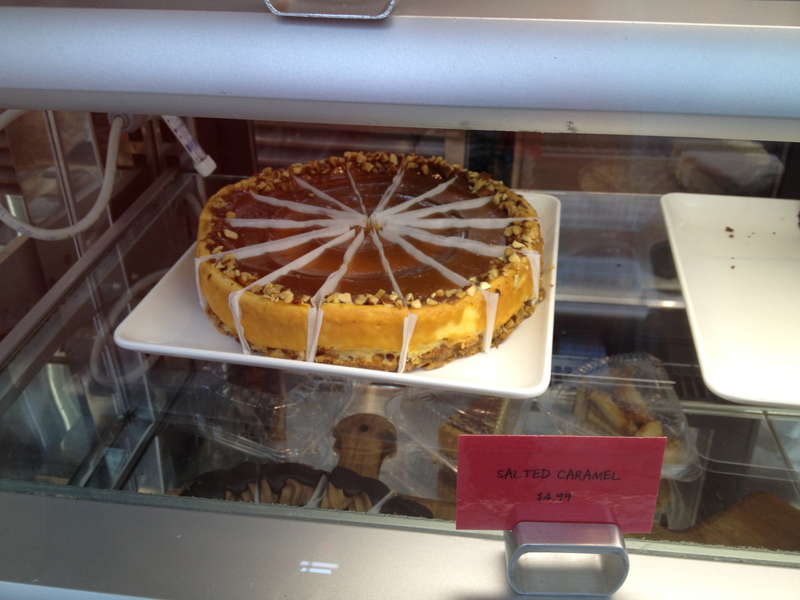 As if the Vosges chocolates and Garrett popcorn weren’t enough temptation, there was always Eli’s Cheesecake, recently famous for creating the celebration cheesecake for President Obama’s Inauguration! What’s not to like about that? 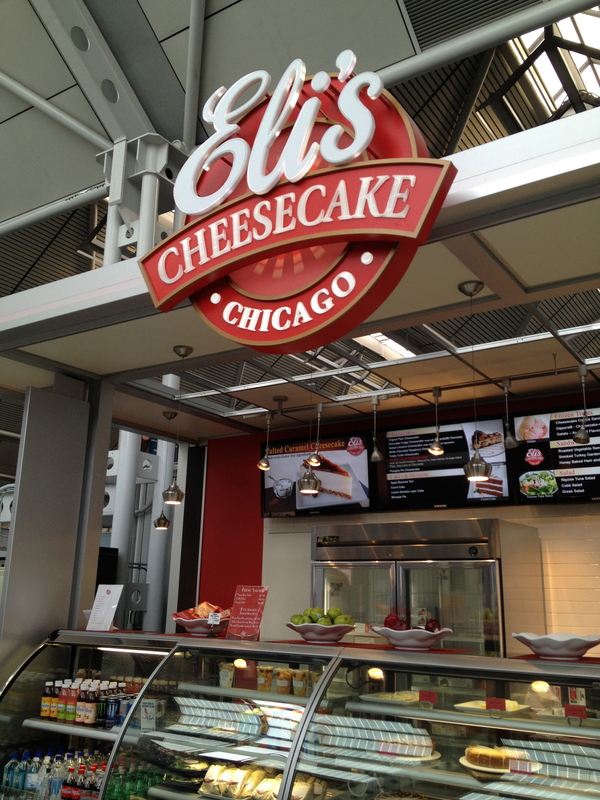 You can get a boxed-up, ready to fly home cheesecake from Eli’s! Rick Bayless’s Tortas Frontera lured travelers with the sight of freshly baked loaves of bread stacked up in the window and the smell of tortas — griddle-baked Mexican sandwiches filled with chipotle chicken! 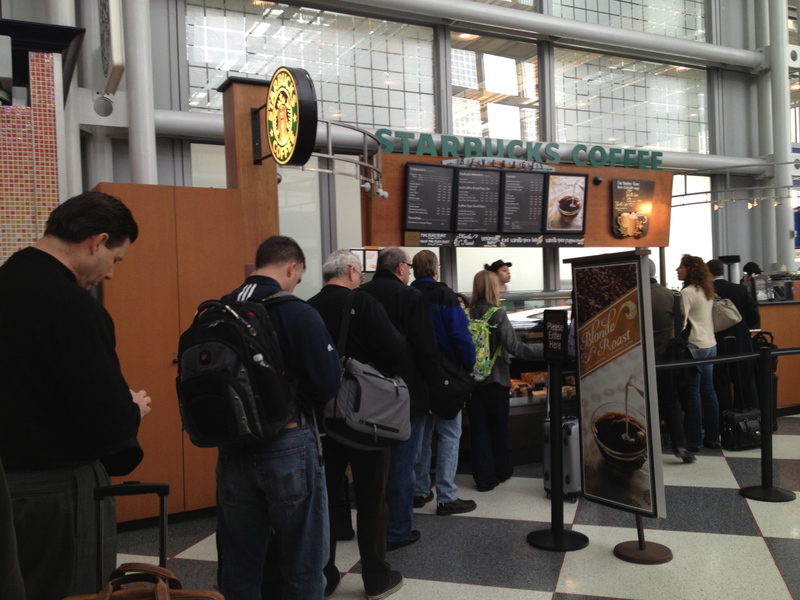 Posted on the website is a quote from the Chicago Tribune: “Finally, a reason to get delayed at O’Hare”! I agree. But movement and tech were as important as food and art that day. Lined up at charging/working stations were travelers catching up and powering up. 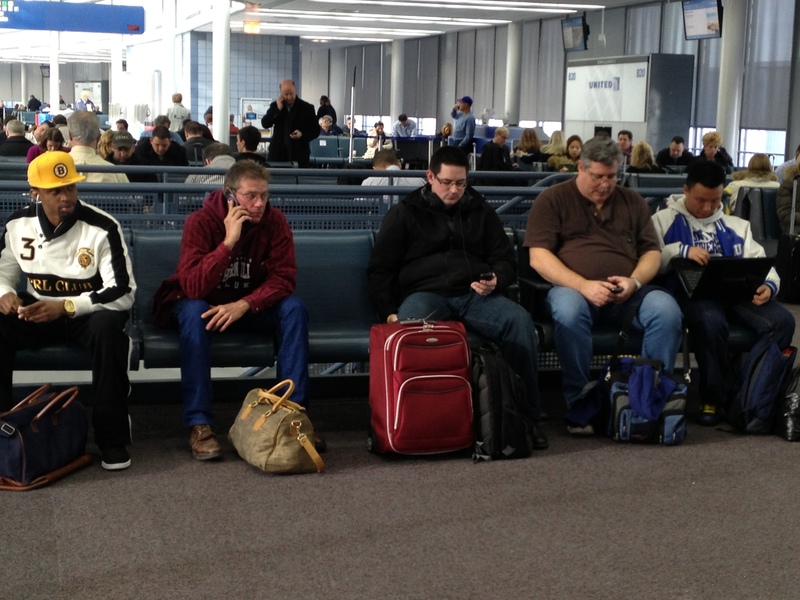 . .
Hardly an empty seat at the charging stations! 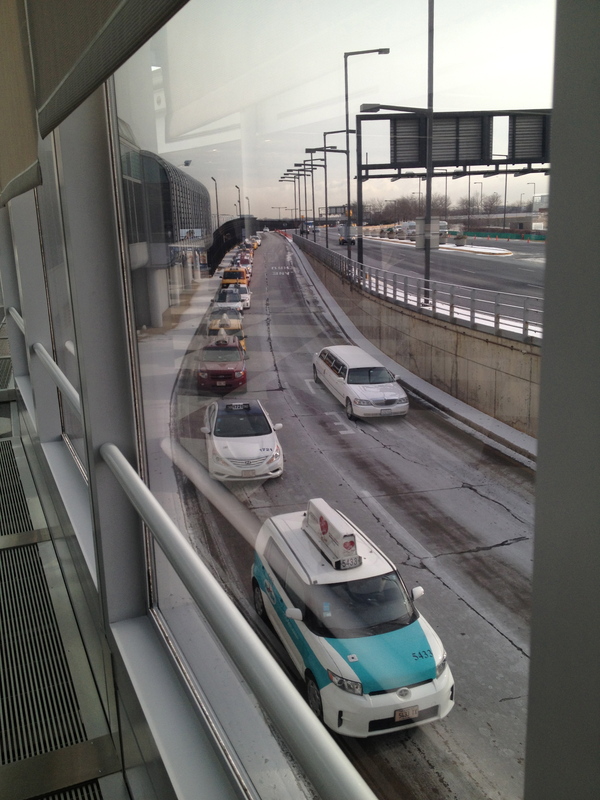 while outside, taxis lined up to move people — wherever they needed to go. At the end of the terminal, however, it was hurry up and wait. And talk. And check that email one more time. After all, that’s what travel is today! This entry was posted in Food, Restaurant, Retail Shops, Travel and tagged After School Matters, chocolate, Eli's Cheesecake, Field Museum, food, Garrett's, Montblanc, O'Hare Airport, Oakley, Starbucks, Tortas Frontera, travel, Vosges, Wolfgang Puck. Bookmark the permalink. 23 Responses to Love food? Love art? 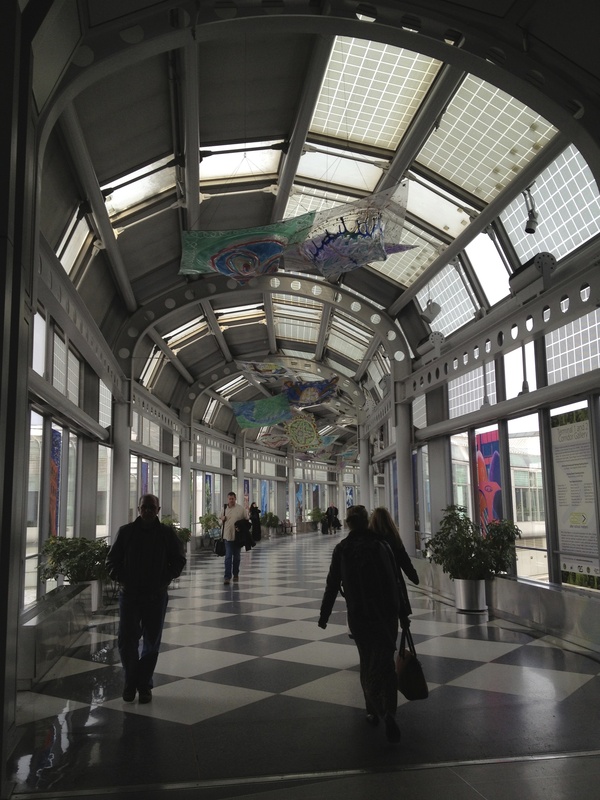 Route yourself through Chicago O’Hare! 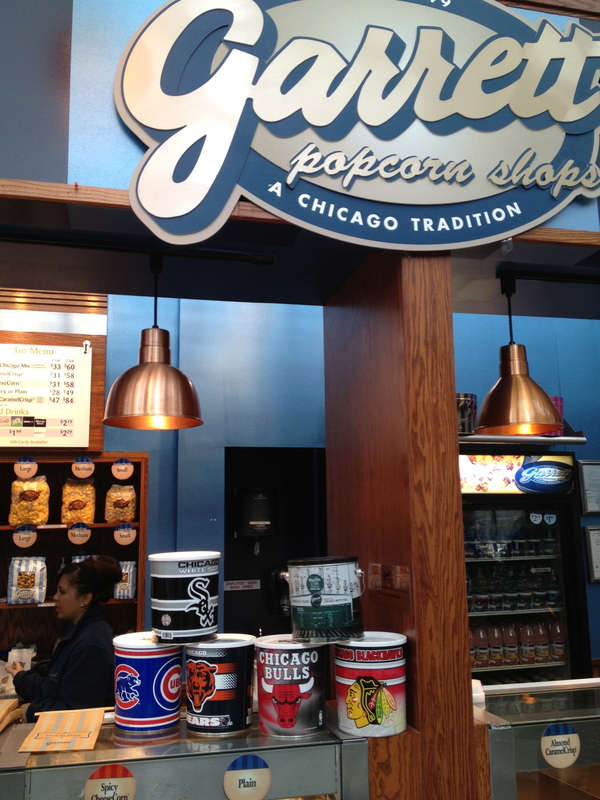 Rusha, your endorsement of the popcorn alone tempts me to route my next connecting flight through Chicago O’Hare. 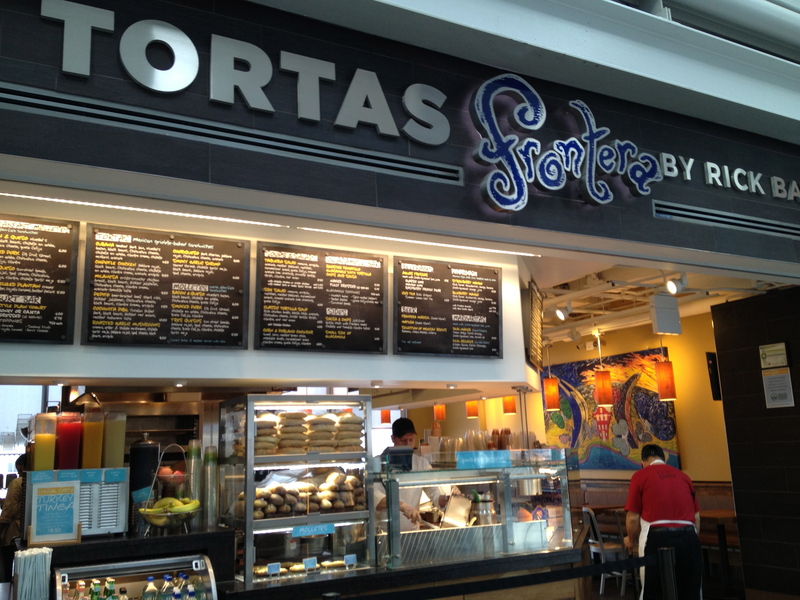 But I’d also have a Lime Aqua Fresca at Tortas Frontera — the most refreshing beverage I’ve had IN MY LIFE. Seriously. Thanks. I love seeing the places you see! Now I’ve got a reason to return — that drink sounds outstanding! Thanks for commenting! wow this is awesome.. makes me look at airports in a different light 🙂 great post! I actually love airports that have interesting food, art, murals, etc. When you spend a lot of time waiting, it can be a great place to visit! Thanks for reading & commenting! Thanks so much for nominating me for the Inspiring Blogger Award!! I’ll see what I can do to complete the requirements! I enjoy each of your blog posts! I’m always racing from flight to flight… thanks for slowing me up!! Some airports offer little, and that seems to be the ones in which I spend the most time! There’s never enough in the big airports for a leisurely stroll through the shops or a great meal. Such is life! 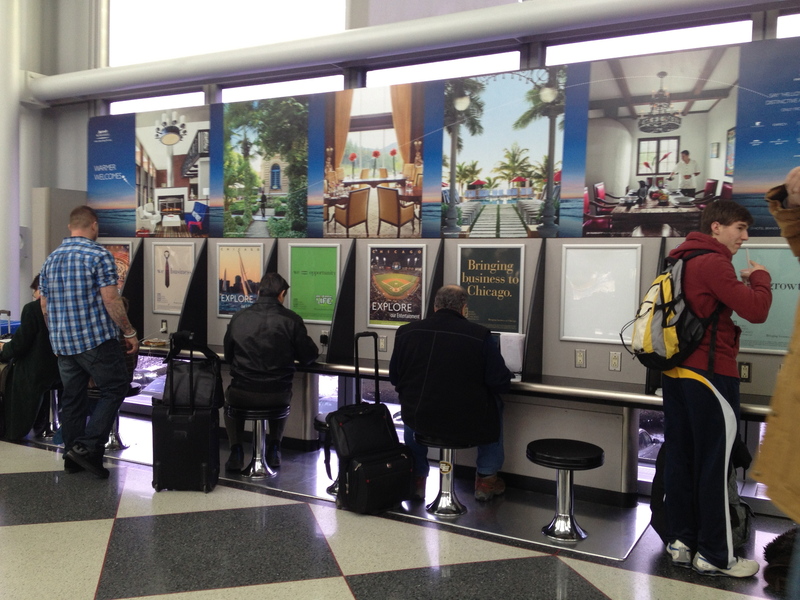 Love airports everywhere – thanks for visiting! You’re welcome! So glad I’ve found your great blog! I read on another blog that there’s a great Mexican restaurant at O’Hare.The name escapes me right now, but its sounds even more like a place I’d like to transit through. I think the best airport for tourism is Amsterdam Schiphol. There’s a small wing of the Rijksmuseum inside the airport, and the airport itself is direcly connected to the rest of the Netherlands by train. If you have a long layover, it’s easy to organize a day trip to Amsterdam or the Hague from the airport. Great info! I’ve been to Amsterdam but it was quite a long time ago. Would love to see the Rijksmuseum right inside the airport! I’m liking what cities are doing to enhance our travel experience, for sure! Thanks for reading and commenting! Glad you enjoyed the post! You’ll have to go there and get popcorn, chocolates, or one of those $1000 pens! Thanks for reading ! Thanks so much for reading and commenting! Airports are becoming more fascinating places — and it’s not just the shops! I still just love to sit and watch the people and the hustle bustle. Very entertaining! The last time I passed through O’Hare was long, long ago (1985). You’re so right. And there are many other things I miss about flying in the “old days”! Like food on the plane, people dressed nicely, no shoving to cram carry-on bags in too-small overhead bins . . . Ahhh, travel! Thanks for reading and commenting! Side note, this was the subject of a final Jeopardy question a while back – which major city’s airports are both WWII themed? Chicago! 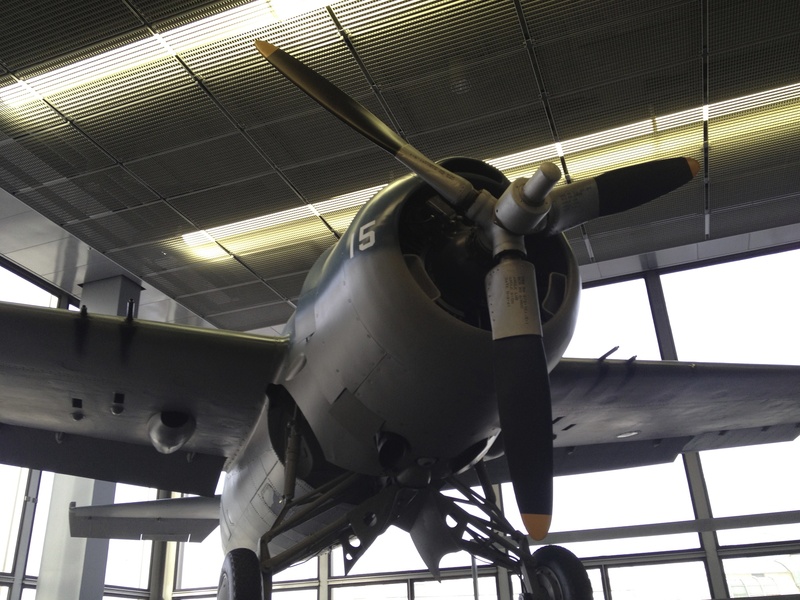 The Midway airport was named after the battle of Midway, which was the most important naval battle of the Pacific Campaign of WWII, according to Wikipedia. Thanks for the reply! It’s great to know that fellow travelers have noticed many of the same icons that I have. The plane is great for my history side, but the popcorn is great for my hunger side! Happy travels. I love your Blog! How nice to see the airport through different eyes. So positive and fun! Thank you for the tour…I look forward to your next adventure! Thanks for reading and commenting! Here’s another one you might like on Silver Spring, MD. You’ll even see a couple of people you know in the pics!